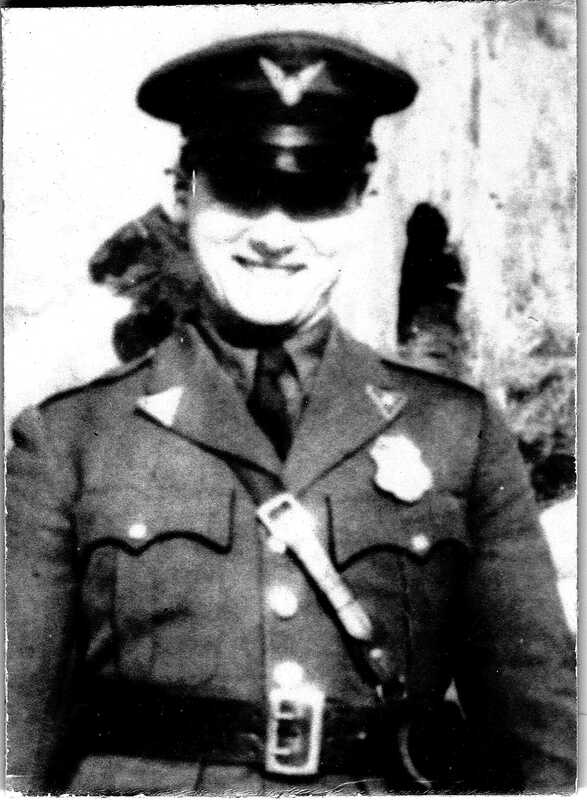 Amos L. “Spud” Helms was hired by the Oregon State Traffic Division as a traffic officer October 8, 1930, just a few months before the Oregon State Police was formed in August of 1931. Before becoming a traffic officer, Amos had been a semi-pro baseball player and was considered a fine infielder for the Portland Beavers and other teams of the Blue Mountain League. He was a deputy sheriff for four years prior to joining the Traffic Division. He was stationed in La Grande. On October 18, 1931, just 79 days after the formation of the Oregon State Police, Trooper Helms and Captain Lee H. Noe were driving in the business area of La Grande and spotted a car with Missouri plates. They suspected that it was the vehicle that had been reported as used in a robbery in Idaho Falls. When they attempted to stop the automobile two of the occupants, 19 year-old Keith Crosswhite and 28 year-old John Owen both from Missouri, opened fire on the two police officers. Trooper Helms was hit and went down. Captain Noe emptied his revolver at the fleeing auto, but the occupants escaped. One of the occupants of the fleeing car was a 16 year-old girl that had joined the two shooters in Idaho. On the way out of La Grande they dropped the girl off. She was located by officers and held as a material witness. The search for the fugitives was joined by state and local law enforcement officers and two squads from Company E of the 186th Infantry. The search was aided by an aircraft flown by Dud Rankin with Oregon State Police Trooper Willard Tubbs with him in the plane. The killers were captured 40 hours later after they had abandoned their automobile and fled on foot into the Blue Mountains near Meacham. Sheriff Jesse Breshears, Game Warden Frank Osmond and W. E. Carpenter, a citizen posse member spotted the two as they crossed a ridge. When the two emerged from the brush they were arrested without a fight and lodged in the Union County Jail. A few weeks later Ollie Crosswhite the father of suspect Keith Crosswhite visited his son in jail. Mr. Crosswhite, a law enforcement officer from Springfield, Missouri, returned home and on January 4, 1932 he and five other law enforcement officers were killed in a gun battle when the group went to arrest two brothers. Keith Crosswhite was in his jail cell awaiting his trial for murder when he was informed of his father’s death. Crosswhite and Owen were found guilty of murder and sentenced to life in prison. Crosswhite was pardoned in 1942 and Owen was paroled in 1950. Thirty-year-old Officer Helms clung to life for 73 days with his wife by his side but died on December 29, 1931. His funeral and burial services were arranged and attended by a large number of Oregon State Police and other law enforcement officers from around the state. Two of the pallbearers at his funeral, Officers Ted Chambers and Elmer Pyle, would eventually be killed in the line of duty. Trooper Willard Tubbs who was part of the search party was also killed in the line of duty. Amos Helms is buried in Hillcrest Cemetery in La Grande. His headstone bears a memorial plaque from his fellow officers of the Oregon State Police. A short time later the citizens of the La Grande area donated funds to purchase a First Aid Car that was named the Amos L Helms First Aid Car. Amos Helms was born June 16, 1901 in Harrison, Idaho, to John and Claudine Helms and had an older sister, Dessie (Dessa). He married Echo Hollen of Condon but they had no children.